NEW DELHI, Feb 19 2015 (IPS) - So much information about climate change now abounds that it is hard to differentiate fact from fiction. Scientific reports appear alongside conspiracy theories, data is interspersed with drastic predictions about the future, and everywhere one turns, the bad news just seems to be getting worse. Corporate lobby groups urge governments not to act, while concerned citizens push for immediate action. The little progress that is made to curb carbon emissions and contain global warming often pales in comparison to the scale of natural disasters that continue to unfold at an unprecedented rate, from record-level snowstorms, to massive floods, to prolonged droughts. The Global Sustainability Report 2015 released earlier this month at the Delhi Sustainable Development Summit, ranks the top 20 countries (out of 193) most at risk from climate change based on the actual impacts of extreme climate events documented over a 34-year period from 1980 to 2013. The TERI report cites data compiled by the Centre for Research on the Epidemiology of Disasters (CRED) based at the Catholic University of Leuven in Belgium, which maintains a global database of natural disasters dating back over 100 years. In preparing its rankings, TERI took into account everything from heat and cold waves, drought, floods, flash floods, cloudburst, landslides, avalanches, forest fires, cyclone and hurricanes. Mozambique was found to be most at risk globally, followed by Sudan and North Korea. In both Mozambique and Sudan, extreme climate events caused more than six deaths per 100,000 people, the highest among all countries ranked, while North Korea suffered the highest economic losses annually, amounting to 1.65 percent of its gross domestic product (GDP). The year 2011 saw 350 billion dollars in economic damages globally, the highest since 1975. The situation is particularly bleak in Asia, where countries like Myanmar, Bangladesh and the Philippines, with a combined total population of over 300 million people, are extremely vulnerable to climate-related disasters. China, despite high economic growth, has not been able to reduce the disaster risks to its population that is expected to touch 1.4 billion people by the end of 2015: it ranked sixth among the countries in Asia most susceptible to climate change. Sustained effort at the national level has enabled Bangladesh to strengthen its defenses against sea-level rise, its biggest climate challenge, but it still ranked third on the list. India, the second most populous country – expected to have 1.26 billion people by end 2015 – came in at 10th place, while Sri Lanka and Nepal figured at 14th and 15th place respectively. In Africa, Ethiopia and Somalia are also considered extremely vulnerable, while the European nations of Albania, Moldova, Spain and France appeared high on the list of at-risk countries in that region, followed by Russia in sixth place. In the Americas, the Caribbean island nation of St. Lucia ranked first, followed by Grenada and Honduras. The most populous country in the region, Brazil, home to 200 million people, was ranked 20th. In the 110 years spanning 1900 and 2009, hydro-meteorological disasters have increased from 25 to 3,526. Hydro-meteorological, geological and biological extreme events together increased from 72 to 11,571 during that same period, the report says. 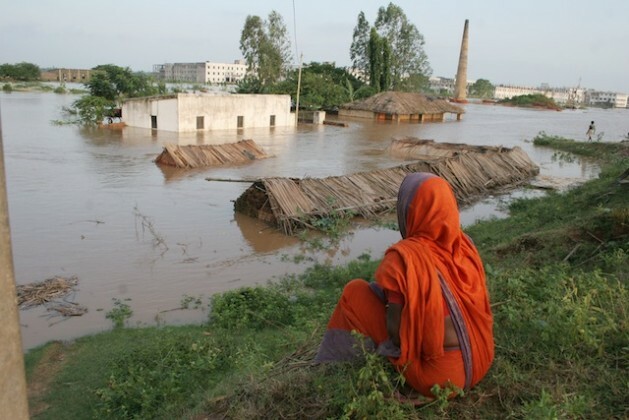 In the 60-year period between 1970 and 2030, Asia will shoulder the lion’s share of floods, cyclones and sea-level rise, with the latter projected to affect 83 million people annually compared to 16.5 million in Europe, nine million in North America and six million in Africa. The U.N. Office for Disaster Risk Reduction (UNISDR) estimates that global economic losses by the end of the current century will touch 25 trillion dollars, unless strong measures for climate change mitigation, adaptation and disaster risk reduction are taken immediately. As adaptation moves from theory to practice, it is becoming clear that the costs of adaptation will surpass previous estimates. Developing countries, for instance, will require two to three times the previous estimates of 70-100 billion dollars per year by 2050, with a significant funding gap after 2020, according to the United Nations Environment Programme’s (UNEP) Adaptation Gap Report released last December. Indicators such as access to water, food security, health, and socio-economic capability were considered in assessing each country’s adaptive capacity. According to these broad criteria, Liberia ranks lowest, with a quarter of its population lacking access to water, 56 percent of its urban population living in slums, and a high incidence of malaria compounded by a miserable physician-patient ratio of one doctor to every 70,000 people. On the other end of the adaptive capacity scale, Monaco ranks first, with 100 percent water access, no urban slums, zero malnutrition, 100 percent literacy, 71 doctors for every 10,000 people, and not a single person living below one dollar a day. Cuba, Norway, Switzerland and the Netherlands also feature among the top five countries with the highest adaptive capacity; the United States is ranked 8th, the United Kingdom 25th, China 98th and India 146th. The study also ranks countries on responsibilities for climate change, taking account of their historical versus current carbon emission levels. The UK takes the most historic responsibility with 940 tonnes of CO2 per capita emitted during the industrialisation boom of 1850-1989, while the U.S. occupies the fifth slot consistently on counts of historical responsibility, cumulative CO2 emissions over the 1990-2011 period, as well as greenhouse gas (GHG) emission intensity per unit of GDP in 2011, the same year it clocked 6,135 million tonnes of GHG emissions. China was the highest GHG emitter in 2011 with 10,260 million tonnes, and India ranked 3rd with 2,358 million tonnes. However, when emission intensity per one unit of GDP is additionally considered for current responsibility, both Asian countries move lower on the scale while the oil economies of Qatar and Kuwait move up to into the ranks of the top five countries bearing the highest responsibility for climate change.